*New for 2015. The M43-C1 is Vizio’s second generation 43-inch 4K Ultra HD LED backlit Smart TV. This 4K TV has about the same resolution as the 4K Projector in your local movie theater. For 2015, the Vizio M43-C1 has a full array LED display with 28 active zones. 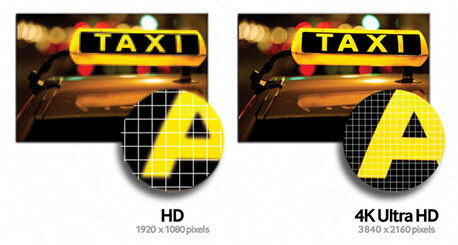 The local dimming zones ensure better picture with deeper blacks, higher contrast, and uniform image. The display has a 20,000,000:1 contrast ratio, 120Hz along with the 360 Clear Action Rate, provides blur free, clear motion. The 4K Ultra HD display has over eight million pixels of resolution (4x higher than Full HD). The Spatial Scaling Engine upconverts HD content to 4K. Sound is provided by a DTS StudioSound™ sound system. VIZIO Internet Apps Plus™ with the built-in wireless Wi-Fi (802.11 AC) gives you instant access to a world of streaming movies, TV shows, music, and more. This includes Netflix (with subscription), Youtube, Amazon Instant Video, Facebook, Blockbuster, Hulu Plus, Twitter, Sports and more. Send content from your smartphone or tablet to your TV. The 43-Inch VIZIO M43-C1 has an Ultra Slim Design, and is only 2.7 inches thick (without the stand) and has an ultraslim bezel. ENERGY STAR® 6.0 compliant. ATSC with QAM digital TV tuners built in. 1 Component video input, and 5 HDMI inputs (one is HDMI 2.0) for full HD connectivity for DVD players, Blu-ray, PS3, Camcorders, PCs and a range of other digital devices. Also features two 10 watt stereo speakers. 1 USB 2.0 port for digital photo/video/MP3 playback, Ethernet port. Smart-Review Commentary: For 2015, The VIZIO M-Series M43-C1 43-inch 4K Smart TV is loaded with all the latest advanced features. 4K Ultra HD has 4 times the resolution of HDTVs, and is the future of television going forward. Features include the premium Full Array Local Dimming: (local dimming gives deeper blacks and better picture), 120Hz refresh rate (reduces motion blur for fast moving movies and sports), Built-in Wireless WiFi (802.11 AC Dual Band) which is 3x faster, HEVC Decoder, along with Vizio Apps for access to Smart TV internet content including Netflix®, Facebook, Amazon Instant Video, Youtube, Hulu Plus™, and hundreds more available. One of the five HDMI ports is HDMI 2.0 (capable of 60Hz). The biggest upgrades for the M Series M43-C1 is upgrading this series to 4K Ultra HD resolution, an upgraded V6 Six-core processor, and its full array of LED lights. Vizio has also added a feature called Active Pixel Tuning, which adjusts the brightness of individual pixels dynamically. 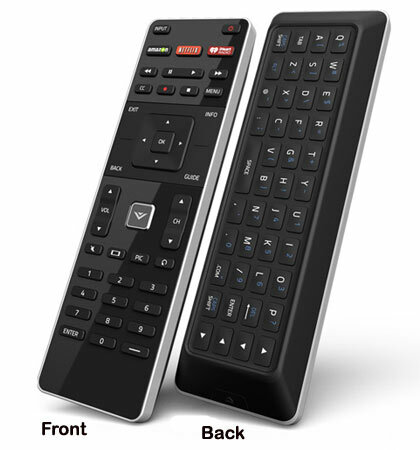 The included Smart Remote has a backlit keyboard for easy use. ENERGY STAR 6.1 compliant, draws only 88.9 watts of electricity. Audio features include DTS TruSurround to simulate surround sound with 2 speakers. 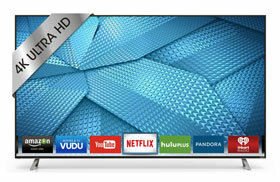 This TV does not have 3D, as Vizio has dropped the 3D feature from its entire line of TVs. The M43-C1 is Vizio’s lowest cost 4K Ultra HD TV. It has received very good reviews and is a great value for a 43-inch 4K TV. It is a SmartReview Top Pick for 2015.